INDIANAPOLIS – A Facebook photo of a homeless man, possibly suffering from starvation, helped a family reunite with their loved one after seven years. 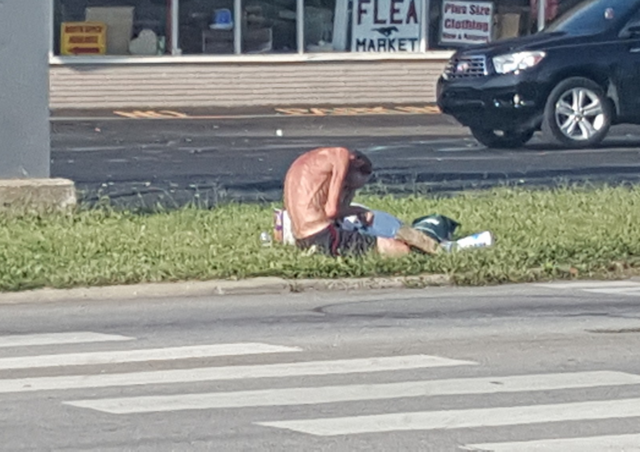 Johnny Rhodes, who was in the photo, was seen sitting outside of a flea market near Thompson Road and Madison Avenue. The photo was shared more than 1,000 times and caught the attention of Johnny’s brother, Danny Rhodes. "I'm so sick to my stomach right now,” said Danny. “I can't function to know someone is living this way and looks this bad." Danny said he has not seen Johnny since their mother died seven years ago. He said Johnny had a history of drug and alcohol abuse. Danny immediately wanted to find his brother to get him help, but locating him again was an issue. Amy Renae Smith, who doesn't know the family, saw the picture, and created a “Searching for Johnny Rhodes” Facebook page, and filed a missing person report with police. "Since he is over the age of 18, it's up to him what he wants to do and if he wants to reach out to anybody,” said Smith early Monday. Late Monday afternoon, Johnny’s family found him once again and he was reunited with his loved ones. Danny Rhodes says Johnny refused their offer of help, but he will continue to try to reach out to his brother. Tuesday morning, Smith posted again, with an update on Johnny. "He had two meals, a hit [sic] shower, a pair of clean clothes, a room to himself with quiet, a king size bed, tv w/ cable, fridge, a microwave, Pepsi, & leftovers. He is safe, and resting," she wrote.